In this week’s economic update, we explore possible rationale for the falling growth rate of China’s GDP; gaining insight from key macro-economic factors and updates from this week’s summit in Davos. Following this, we report on the strong start to the US quarter four earnings season as we wrap up what has been an incredibly strong 2018 for the corporate sector, before looking ahead to analyst’s expectation for 2019. Amidst growing global tensions, from government shut-downs to Brexit, alarmists may have thrown a party to celebrate the news in early January that China’s quarter 4 GDP growth rate dipped to 6.4%, the slowest rate of annualised growth in the last three decades. However, before getting worked up into a lather it is worth revisiting comments from Wang Qishan, China’s vice-president, who popped up at the World Economic Forum in Davos to dispel fears about the slowdown in growth. In his speech, filled with passion, he proclaimed that Q4 growth was slower, but it was still “a pretty significant number, not low at all”. Importantly, behind the number, there is a push for quality and domestically generated, self-sufficient, growth. The chart below gives a much longer term perspective of China’s economic growth path. Based on historic data 2018 was the slowest year of GDP growth since 1990 but there is a pragmatic aspect. Growth is coming from exceptional trend highs of more than 15% intra quarter. Even for China it is too much of an ask to expect these rates to be sustained over the long run even with ample monetary and fiscal stimuli. What lies behind the slowdown? Primarily, the reduction in growth rates has not been a sudden phenomenon. There has been a ‘managed’ transition in growth since 2010 when, arguably, the economy started to mature and transition from a low-cost manufacturing and export led economy to one which is more dependent on growth from consumer spending. This is just a natural cycle that economies progress through as they mature from emerging to developed status. Beijing has also been engaging in a campaign to control financial risk created by the economy’s reliance on debt-fuelled stimulus. The rationale for this is to reduce China’s extensive debt levels in the long-run, but a by-product is a sharp slow-down in infrastructure spending by private firms with reduced access to credit. In the closing statements of Wang Qishan’s dialogue, he indicated that if the growth rate fell too quickly his government would “pull out all the stops to maintain the many years of growth”. This echoes the belief of many economists in that Beijing will ramp up stimulus measures in the coming months, including additional cuts to banks’ required reserve ratio and tax cuts. Despite the trend growth rate shift and individual factors impacting growth, China’s economic performance exceeds that of the world’s most developed countries. There is clear blue sky between them. Therefore, the apparent negativity seems wide of the mark when there is still ample reason to be positive on China’s growth prospects. For corporate America the beginning of January signals the start of Q4 earnings season. Earnings season is a look back event and it allows investors to gain insight into the financial health of some of the world’s largest institutions. Data on profits and sales help market participants make decisions on whether current price levels are justified. Throughout 2017, and the first three quarters of 2018, earnings soared, helped along by loose monetary policy and a sizeable fiscal stimulus package. Tax changes reduced the Federal corporate tax rate from 35% to 21%. Cutting taxes for businesses is a Trump administration flagship policy to help promote ‘America First’. The tax package boosting profits also helped fuel a record-breaking share buyback programme. This has been facilitated by the repatriation of cash balances, previously parked overseas to avoid paying tax at hitherto high rates. Once repatriated the cash sums attracted less tax and, in many instances, was used to buy back shares to boost earnings per share. At the same time companies have been increasingly borrowing money at low rates of interest, again buying back shares with the monies raised. Expecting a faster rate of earnings growth investors pushed up share prices leading to high price earnings (P/E) ratios; the market’s P/E multiple peaked at 23.4x on 26th January 2018. However, in the cold light of day investors have reassessed the wisdom of putting a higher valuation on businesses that have borrowed money to buy back shares. The stock market P/E has since retraced to today’s level of 16.9 times earnings. At this point 98 of the 500 listed companies making up the S&P500 index have reported sales and profits numbers. A reasonable sample but there is still a long way to go before we can judge the outcome across all corporate USA. Based on the early sample, three quarters of firms reported ‘beats’ i.e. when corporations exceed analysts’ earnings expectations. Admittedly, these expectations had been lowered, against a backdrop of uncertainty around the Federal Reserve’s interest rate trajectory and trade tensions with China, but the better mood associated with exceeding expectations has helped market sentiment. While earnings season mainly shows what has happened in the past it also has a forward-looking function. At each quarterly update companies provide analysts with future guidance on their profit outlook. Granted, this is where corporate managers play a little game. At the start of each year they usually try to ‘talk down’ numbers, hoping that as the year unfolds they will exceed their knocked down profit forecasts. Looking at the chart above, and forecasts for earnings in 2019, we believe there are two forces at work. First, the boost from the lower corporate tax rate is starting to fall away. 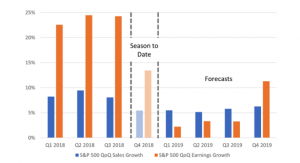 Second, analysts are trimming earnings for 2019 because corporate managers are playing the earnings game. 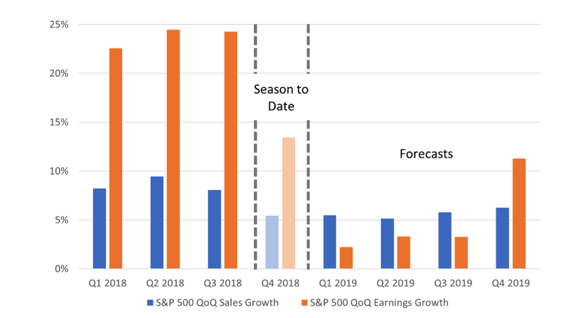 In this context the big drop in earnings growth in 2019, relative to 2018, is less of a worry. Another thing to bear in mind is that 80% of firms reporting profits now are experiencing quarter-on-quarter growth in earnings and sales. This means the market is showing breadth of profits growth. Once all companies have reported their profits for the final quarter of 2018 we think 2018 will be remembered as a year of incredible earnings for corporate USA. It has set the bar higher for this year making it almost impossible to repeat growth of over 20%. However, if, as expected, earnings guidance translates to forecast growth of 6-8% for all 2019 there is a reasonable chance that companies will exceed these levels when they report realised profits. In the meantime, we eagerly await the results of those yet to round off the quarter 4 2018 reporting season thereby revealing what the final tally in earnings growth will be after Trump’s tax boost.